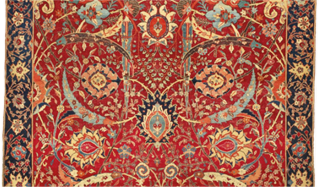 Today’s sale at Sotheby’s of William Andrews Clark’s Sickle-leaf, Vine Scroll and Palmette ‘Vase’-technique carpet for $33.76 M has enormous significance not only for the antique Oriental rug field, but for the art world as a whole. Clearly the sale of this fabulous, incredibly rare historical carpet that was likely woven in the Persian city of Kirman, for over 3-1/2 times the previous world record is a landmark, but it is also a precursor of a movement to come: the recognition that the best Oriental rugs woven in the 16th through 19th centuries stand on par with the highest valued art works of other mediums. A great rug possesses the ability to affect the mind and heart of man to see himself and the world in which he lives in a deeply nourishing manner, which is the true definition of art. It highlights what I have been saying for over 30 years–that antique Oriental carpets are undiscovered art that is now starting to become discovered.